Spray 6-quart slow cooker with cooking spray. In large bowl, beat Cake ingredients with electric mixer as directed on cake mix box. Pour into slow cooker. In medium bowl, beat pudding mix and 2 cups milk with whisk as directed on box. Pour into slow cooker over cake batter. Do not mix. Sprinkle chocolate chips over top. To make your chocolate lava cake boozy, replace 1/4 cup of the milk in the cake batter with coffee- or chocolate-flavored liqueur. To prevent the lava cake from burning around the edge, line the slow cooker with cooking parchment paper. Not that most people need convincing, but this chocolate cake is one you really shouldn’t pass up. And you don’t need to take our word for it, home cooks across the country have fallen for this ooey-gooey, extra-chocolatey cake — check out the 100-plus positive reviews! The texture and flavor that make this cake so good are due to the addition of chocolate pudding and chocolate chips, but the cooking method also plays a role. 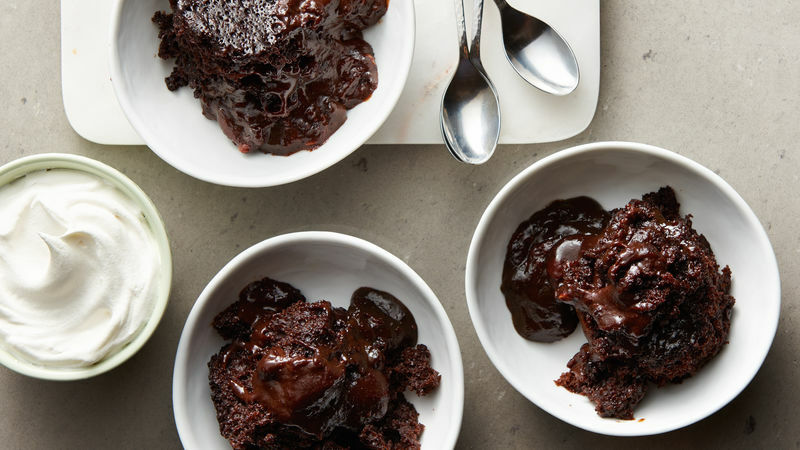 “Baking” the cake in the steamy slow cooker helps keep it super moist, so you get all the texture of your favorite restaurant “lava cake!” Master this recipe and then explore the rest of Betty’s chocolate cake recipes. And don't forget to check out her article on how to make cake to ensure success every time.